Among Saigon’s many dessert offerings, Greenie Scoop is special. The gelato maker delivers a world-class product through an attentive process that starts with meticulous selection of the fruits used to make the gelato, fruits that are then carefully handled in production facilities with US-grade food safety standards. It ends with tasty, creamy gelato, a perfect treat to abate Ho Chi Minh City’s heat. Company founder Ly Huy Sang has a tall order for his suppliers and buyers: get me nothing but the best. The durian that makes one of Greenie Scoop’s more popular gelatos, for instance, is sourced from the renowned Lai Thieu orchards in Binh Duong Province. The region’s fruit is lauded for the carefully made crop and the close relationship farmers have with their product, which is evidenced by how the growers live right next to their crop. But just being a durian fruit from the acclaimed region isn’t enough to make the cut. The gelato maker does not buy the durian if it has been fertilised just before harvest and also declines if the fruit has not been watered daily. Additionally, company founder Ly Huy Sang instructs his buyers target only the “milky” durian, an older crop of durian fruit that has more fragrance and juice than modern iterations. The gelato maker is equally strict in its strawberry sourcing. 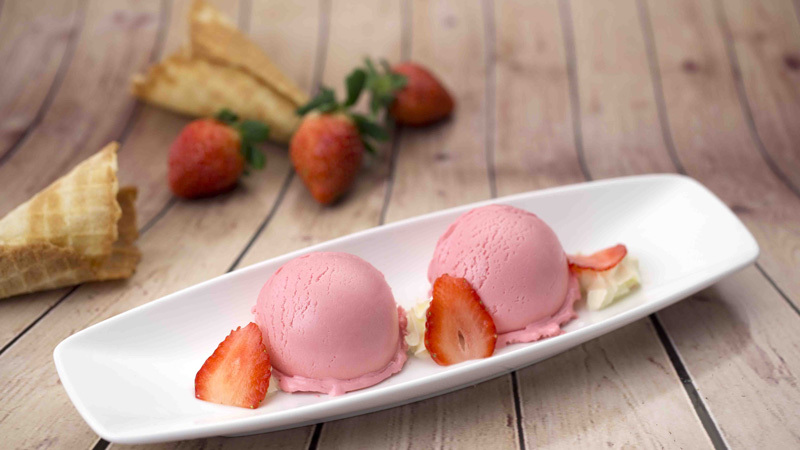 The strawberries in Greenie Scoop’s gelato come from Da Lat’s Biofresh Farm, which grows the fruit in accordance with European organic crop standards. Top French agroscience experts have been helping the farm grow fresh, pesticide-free strawberries since 2010. Where quality local ingredients aren’t available, Greenie Fresh has sought vendors beyond Vietnam’s borders to create a product that meets its standards. The chocolate gelato is made with Valrhona’s cocoa beans grown in southern France. Ly selects only the best beans grown there for his customers in Saigon. The same goes for the vanilla gelato flavour, which comes from French Polynesia. The bourbon vanilla beans from Tahiti Vanille are some of the most venerated vanilla beans grown today. Where quality local ingredients are available, Greenie Scoop uses them. The coffee gelato takes its flavour’s essence from Phuong Vy Coffee House, a coffee roaster that sources its beans from Buon Ma Thuot, the central highlands city often described as the “capital of coffee”. Choose one of these or Greenie Scoop’s other offerings, 18 flavours of premium gelato in total. Each is made with Greenie Scoop’s near-obsessive attention to ingredient quality. As a child, Ly would reportedly insist that his father, a successful porcelain dealer who later founded the Minh Long porcelain company, bring ice cream back when he returned from business trips. His father would oblige his tenacious young son, but the ice cream would always arrive melted. Nevertheless, his early experiences with ice cream cemented him as a devotee. As an adult, Ly would study abroad and travel the world visiting ice cream and gelato stores in the 40-plus countries he visited. After returning home, he started making gelato on his own with italian equipment he purchased. The product was so good that his first tasters encouraged him to scale up his activity to the business that would later become Greenie Scoop. Ly’s exacting demands extend to all aspects of Greenie Scoop’s operations, including health and safety. The company’s equipment and personnel maintain a high standard of cleanliness and neatness, which the company isn’t afraid to show off. The gelato for Saigon’s three stores is made in a factory walled with glass to allow public viewing. Footage of the factory is shown at Greenie Scoop’s stores. An ultraviolet light inside the factory cleanses the facilities of harmful microbes each day. While Greenie Scoop was still in the testing phase, the company’s facilities had achieved hazards analysis and critical control points (HACCP) certification, a US food safety standard originally created to ensure food safety for astronauts in the ’60s. Greenie Scoop’s health standards are top-flight in more ways than one. The food safety and production are rigorously managed because gelato recipes are incredibly susceptible to mistakes, be that by subpar ingredients or an imperfect execution of the recipe. They’re serious about their work, so all you have to do is enjoy. 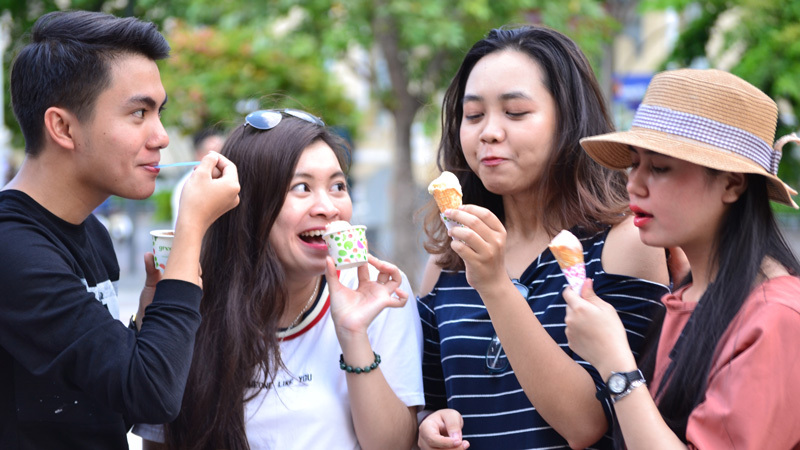 Greenie Scoop has two locations in Saigon: one at the foot of Bitexco Financial Tower next to the Nguyen Hue walking street, and another inside the Vincom Mega Mall. The second store has a traditional gelato serving cart, a cute fixture that makes regular cameos in customer photos tagging this Greenie Scoop store. The company boasts that this is the only machine of its kind in Vietnam. 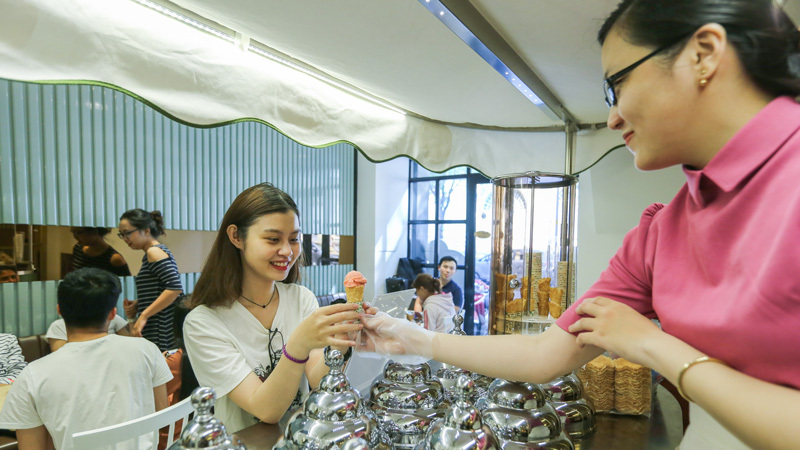 A third store makes Greenie Scoop’s premium desserts available in Thuan An in Binh Duong province.